By now, the innovations of Roberto Rossellini’s War Trilogy—1945’s Rome Open City, 1946’s Paisan, and 1948’s Germany Year Zero—have been so thoroughly absorbed by “realist” films of every stripe that it’s hard to appreciate them as innovations at all. 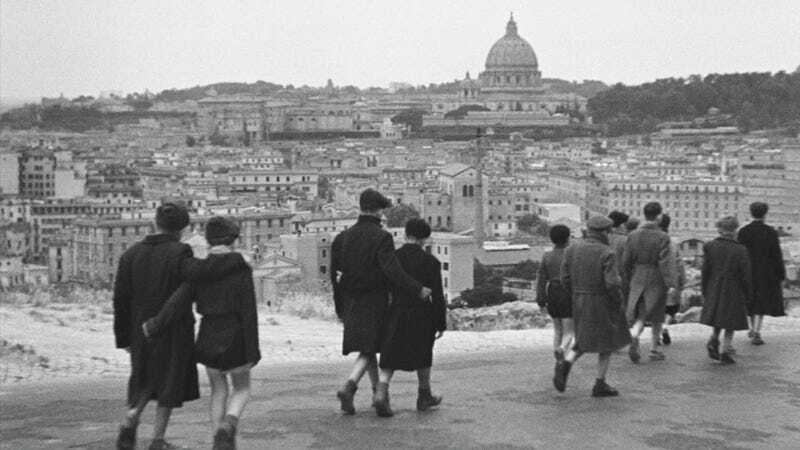 Rome Open City is considered a touchstone of Italian neo-realism, but seen today, once-radical choices like shooting on location (mostly), using non-traditional actors (sometimes), and incorporating the unpredictable rhythms of urban life (to an extent) have become de rigueur. (And if it isn’t clear enough from all those parentheticals, Rossellini wasn’t inclined toward aesthetic absolutes. That’s Lars von Trier territory.) So why are these films so powerful today, now that the shock of the new has long since faded? The answer lies not in the choices themselves, but the impulse that motivated them. Where other filmmakers might have retreated into escapism—witness every director in post-9/11 New York who wasn’t named Spike Lee—Rossellini waited only six months after the city’s liberation in 1944 to set to work on Rome Open City, and he seized the historical moment indelibly, catching the look and the mood of a shaken setting. What resonates most about all three films in the War Trilogy are the ravaged backdrops, which Rossellini shoots with documentary clarity, and a tenor of grief, fear, and displacement that still feels raw. More often than not, the action in the foreground is old-fashioned melodrama, but the images have a natural depth that validates the emotions and makes them seem true. Exhibit A in how neo-realism didn’t immediately dispose of studio theatricality: Anna Magnani’s performance in Rome Open City is full of such outsized passion and resilience that she became an icon. As a Resistance member’s fiancée, Magnani acts as the key agent in a plot to hide the movement’s most important leaders from the Gestapo. Her martyrdom—she’s shot while chasing frantically after a German truck hauling away her husband-to-be—is one of the all-time classic movie moments, but it happens only halfway through a movie that has many more shocks to come. The second half, with its unremitting scenes of torture and execution, remains a bleak tribute to citizens who lost their lives—and in the final shot, a new generation that wouldn’t forget what it saw. Rossellini broadened his ambitions considerably with his follow-up, Paisan, which turns back the clock to follow the Allied campaign through Italy from the south. Divided into six segments, each creeping further north on the map, the film takes the documentary style a step further by opening all of them with a newsreel account of the Allies’ advancement. It’s a quick, easy way for Rossellini to establish the location and context before delving into the human drama, which often has the quality of potent one-act plays. Paisan’s overriding theme is communication, both the tragedies that occur when it breaks down (as when an Italian girl who risks her life to guide soldiers around landmines gets blamed for killing a G.I. she tried to save) and the connections possible when people from different cultures understand each other (as when a G.I. follows a young shoe thief into the shantytown he calls home). Several segments take the form of war adventures, too, but Rossellini’s camera persists on catching unforgettable horrors, like the bodies of dead partisans set adrift on the Po River. Though less heralded than its companions, Germany Year Zero deserves equal recognition for empathizing with ordinary Germans in the days after fascism’s fall and capturing the ruins of a bombed-out Berlin before reconstruction. For a tight 73 minutes, Rossellini looks at the city through the eyes of Edmund Meschke, a 12-year-old boy who escapes various family crises only to find other perils on the streets, including the thriving black-market scene, a pack of like-aged scam artists, and a venal Nazi sympathizer who manipulates him into a terrible act. In spite of subplots aplenty, the best scenes in Germany Year Zero cast Meschke as a poignant tour guide through the rubble-filled streets and building frames, an innocent forced to grow up so fast that in the end, he can’t do it. In the aftermath of war, there’s simply too much tragedy to bear. Key features: Even by Criterion standards, there’s an embarrassment of riches in the set, starting with a 44-page booklet featuring a thorough (albeit sometimes enervating and academic) overview of the trilogy by James Quandt, and individual essays on all three films by various critics and scholars. Each disc includes a video introduction by Rossellini and interview segments with Rossellini expert Adriano Aprà, just for starters, as well as countless hours of interviews, new and vintage documentaries, a commentary track on Rome Open City, and much more. All that’s missing is the blooper reel.